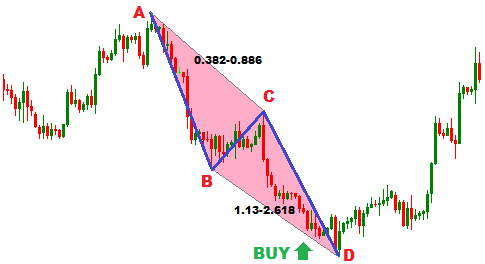 Bullish AB=CD harmonic chart pattern is a very sweet, and very often found chart pattern. It suggests a long position upon completion of the pattern. This post is to explain the way to find a bullish AB=CD harmonic chart pattern on price chart, and the way to trade the pattern . 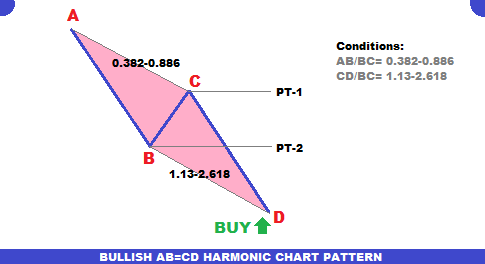 How to find a bullish AB=CD harmonic chart pattern on price chart ? The fist step to find the bullish AB=CD harmonic chart pattern is to find the A and B points of the pattern. A point is found at the top of a bearish trend, and B point is found at the bottom of a bearish trend. In the second step, we are to find the C point of the pattern. 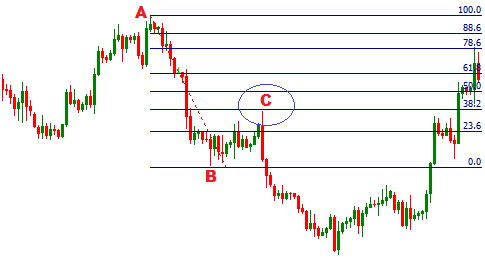 To find the C point, draw a fibonacci retracement tool from A to B. The C point will be found between the 38.2% and 88.6% fibonacci retracement of AB. In the previous step we confirmed the C point of the pattern, and now we are going to confirm the D point of the pattern. To confirm the D point, draw a fibonacci retracement tool from B point to C point. D point will be confirmed by the 2.618% fibonacci retracement level of BC. In the final step we just drawn the AB, AC, BD, and CD straight lines to find the complete bullish AB=CD harmonic chart pattern. This step is not necessary to be drawn on price chart . How to trade the bullish AB=CD harmonic chart pattern? Trading with bullish AB=CD harmonic chart pattern is simple. Just place a buy order when the D point is confirmed. The profit target for the order is to be placed on the horizontal line going through the C point, and the stop loss should be placed at the support level lower the D point. The profit target can also be placed at the 50% fibonacci retracement level of CD. Dear Traders, join the discussion with other traders, dropping a comment below, and subscribe the yourFXguide to receive updates. 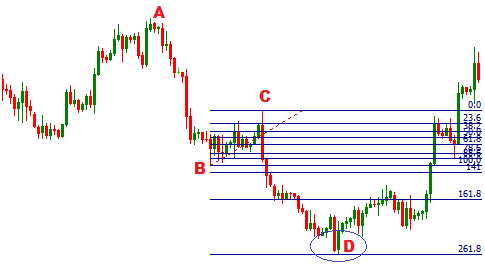 sir when the pattern is invalid ..
if price moving from C to D if price cross above again C means pattern valid or not? No the pattern is not invalid, the new high would be the C point, if the price does not make a new high then the C would not be changed. This is going to the of of my favorite blog to read the marker related information. Thank you sharing the awesome information.